Traders have loads of indicators to look at when it comes to identifying setups, patterns, trends and reversals. These are all viewed in relation to a price chart, which is arguably the most important piece of information a trader can have. Average True Range looks at the distance the price is traveling each day and plots it on a graph. The ATR reading can then be used by traders to determine when markets are most likely to range, when there is a high interest in a trend, or when extreme levels are being reached indicating a reversal. What Is the Average True Range (ATR)? ATR is a volatility indicator developed by J. Welles Wilder, who also created the RSI and Parabolic SAR, among other popular indicators. The “true” range aspect separates the indicator from other volatility measures, such as measuring the difference between the daily high and low to assess how much a stock or commodity is moving each day. When holding positions overnight, traders must also factor in price gaps. Average true range factors in gaps, when required, to provide a truer sense of day to day volatility and movement. ATR does not account for price direction. The job of the trader is to use the price chart to determine direction, and use the ATR indicator to help analyze the price movement. Figure 1 shows the indicator applied to a daily chart of Apple, which has a current ATR reading of 1.607. This means that, on average, the price is moving about $1.60 from day to day. This gives traders an indication of how much volatility or movement they can expect each day. As the chart shows, this ATR value (volatility) fluctuates over time. For day traders, the average difference between the high and low each day may provide a better gauge of volatility for the style of trading, since all trades occur during the day and no positions are held overnight. That said, ATR is still a popular indicator even among day traders for intraday trading and monitoring overall volatility. Absolute value is a positive number. 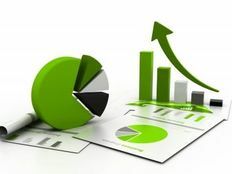 Thankfully the ATR is available on most trading platforms—so calculating by hand isn’t required—such as ThinkorSwim, and a number of free online charting sites including FreeStockCharts.com and StockCharts.com. The ATR can be calculated for, and applied to, any chart timeframe, including 1-minute charts, hourly charts or weekly charts. When using intra-day charts, such as a 5-minute chart, there may be big swings in the ATR near the open if there was a gap in price over night. As the day progresses the ATR will settle down and reflect the movement for just that trading day. ATR is not necessarily a trade signal, although it can be used to help confirm entry points. Since many investors look to buy stocks (and not short-sell them), when a price is declining and then breaks above its trendline, it is a potential buy signal. When the ATR also breaks above its own resistance it confirms the price break higher, since it shows strong movement in the upward direction. Figure 2 shows this on the AAPL daily chart. The price breaks aggressively above a downward trendline. ATR was dropping prior to this, showing that the downtrend was lacking momentum. When the price breaks higher, the ATR also breaks higher confirming the price rise. The same method can also be used to confirm downside breakouts for those wishing to enter short positions. The above example show how the ATR can help confirm trades by looking for a jump in ATR as the price breaks resistance or support. For these trades, traders can look to exit profitable trades using a predefined target, trailing stop or other technical analysis method (see 3 Ways to Exit a Profitable Trade). 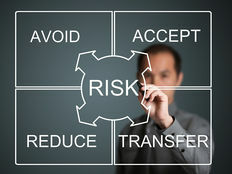 A stop should also be placed on each trade to control risk. Typically a stop is placed below a recent low when taking a long position, or above a recent high when taking a short position (see also 4 Ways to Exit a Losing Trade). After big price moves, like those seen in Figures 2 and 3, that can sometimes mean very big stops. As an alternative to traditional stops and profit taking methods, ATR can be used as both a stop and trailing stop. 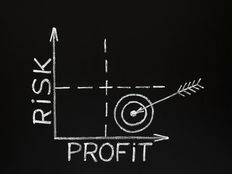 This controls risk, profits from a trend, and then gets you out when the trend may be reversing. Traders use a multiple of ATR, usually 2, 2.5, or 3 to set an initial stop, and then continue to trail that multiple of the ATR behind the price as it moves in their favor. Assume you enter short in Twitter on the break to a new low at $39.67 in April. ATR at that time is 2.32. If using a multiple of 2, a stop is placed $4.64 above the entry price (2 x ATR), which is $44.31. As the trade progresses, ATR will change. Calculate 2 x the daily closing ATR and add it to the closing price (for short positions) to get the new stop level. If the price is moving lower this process will act as a trailing stop. Never move a stop higher than a prior stop. If short, the stop can only drop. If the stop should be higher than the prior stop, keep the stop where it is. This will allow the trade to eventually be stopped out when a reversal occurs. Figure 4 shows some sample readings and highlights when the trade is eventually stopped out on a price reversal by hitting the 2 x ATR stop. The first stop is placed at $44.31, as it can only move lower. Each day the ATR is multiplied by 2 and added to the closing price. If it provides a lower figure than the last, then the stop is moved to this lower level. At the start of May there is sharp sell-off and the price closes at a $30.66 with an ATR of 2.835. This moves the stop to $36.33 [(2 × 2.835) + 30.66]. The price continues to drop through May, but so does the ATR. On May 27 the price closes at $30.51 and ATR is 1.37. The new stop is $33.25 [(2 × 1.37) + 30.51]. This stop is hit shortly after, closing out the position. The same process applies to uptrends. After entry, multiply the ATR by 2 and subtract it from the closing price. Do this each day and adjust the stop accordingly. The stop can only move higher and never move lower, as that would increase your risk. Historically low ATR readings are typically followed by increasing ATR readings as volatility can’t stay low forever. This is why watching for resistance breaks on the ATR can be beneficial. It alerts traders to the potential of a strong move potentially occurring. Similarly, a market can’t stay volatile forever. When ATR is reaching extremely high levels relative to a multi-year history, then the price may be extended (either up or down). Watch for signs of a price reversal and for ATR to break below support, indicating a price climax has potentially been reached. Both of these tendencies can be traded in the ways described above. Interpreting ATR is subjective. There is no level that indicates a stock is about to reverse, or that a trend will continue. Rather, current ATR readings must always be compared to prior readings to get a “sense” of trend strength or weakness. ATR also doesn’t factor direction, only volatility. This can sometimes result in confusing signals at market turning points. A spike in the ATR following a big counter-trend move may make traders think the ATR is expanding to confirm the old trend. This is not the case, though. The new price information reveals a big price reversal, so ATR is confirming that, not the old trend (see figures 2 and 3). When using a multiple of ATR as a stop and trailing stop, the potential profit is unknown. This makes establishing a risk/reward for the trade impossible. The benefit is that if a large trend develops profits can be very large. If trading during a volatile time though, the ATR can be very big, and thus multiplying it by two may make a trade infeasible since the risk would be too large. Day traders will likely find an average of the high minus low provides a better gauge of what a stock does intra-day than ATR. Day traders only trade during the day, so their only real concern is how much movement they can expect between the open and close, or high and low, each day. Average True Range is a versatile volatility indicator that accounts for price gaps. It can be used to confirm entries as well as act as a stop and/or trailing stop. ATR doesn’t look at direction; it is up to the trader to determine whether expanding or contracting ATR values confirm recent price moves. ATR may be useful for day traders for general stock or market analysis, although an average high minus low indicator will provide a truer picture of what is occurring just within the trading day (doesn’t account for gaps). Use ATR to determine when volatility is increasing and when it is contracting; this can help determine the best times to trade.